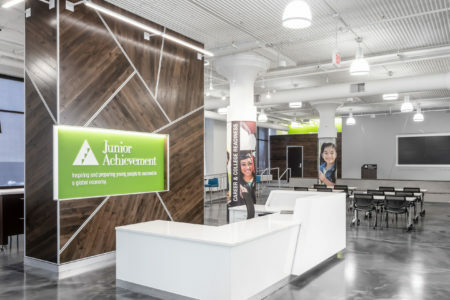 MAPLEWOOD, MN (30 July 2018) — Business leaders, educators and state and city officials received a first look at Junior Achievement of the Upper Midwest’s (JAUM) future headquarters, slated for a November opening with the first students using the facility the week of January 7, 2019. The Junior Achievement James R. and Patricia Hemak Experiential Learning Center is centrally located in the Midway neighborhood of St. Paul, right on the Green Line light rail. The new building will enable JAUM to double the number of students served each year by its on-site experiential programs from 17,000 to 34,000. 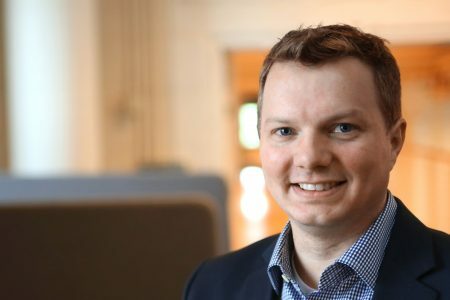 JAUM purchased a 100 year-old building at 1745 University Ave W. in St. Paul, which has been redesigned and refurbished to meet its specific needs with the help of RSP Architects and Mortenson Construction. 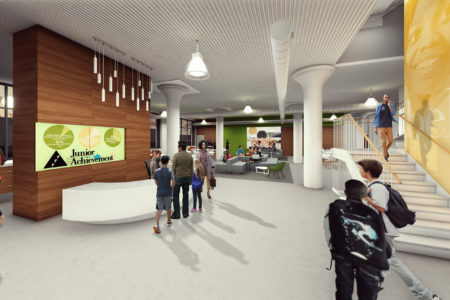 The new building will house three experiential learning labs, including expanded JA BizTown and JA Finance Park programs and a first-of-its-kind JA Innovation Incubator. JA BizTown is a fully interactive free-market lab where students in grades 4-6 learn what it means to be responsible business leaders, consumers, workers, and citizens by participating in this simulated community. Students perform specific jobs within each of the 18 different shops, each of which offers a consumer product or service. Shops are sponsored by Minnesota’s leading companies representing their industry or profession. JA Finance Park teaches middle and high school students about personal finance and career exploration through classroom instruction complemented by a day long hands-on experience where students apply learned concepts in a life-like community. 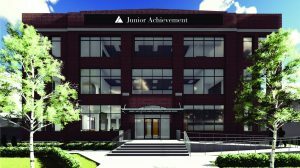 JA Innovation Incubator will encourage high school students to cultivate their entrepreneurial interests and develop relationships, talents and skills to build self-confidence. Students will have access to state-of-the-art technology, including a digital business start-up platform, and the opportunity to learn from local entrepreneurs. 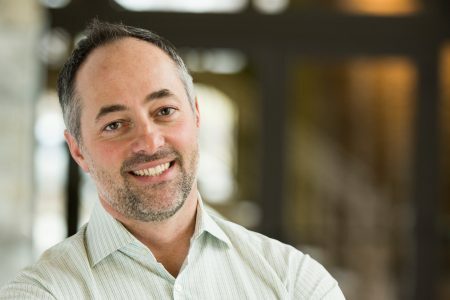 Spurred by a lead gift of $4 million from retail industry entrepreneur and JA alumnus Jim Hemak and his wife, Pat, and $1.4 million donated by the JAUM Board of Directors, the organization is now less than $2 million away from its $20 million fundraising goal for the Let’s Build campaign. 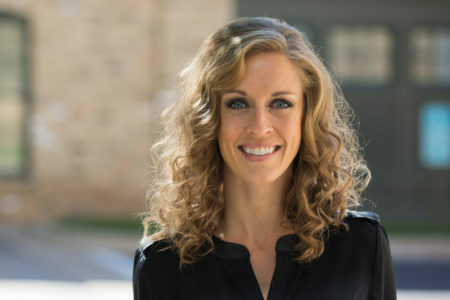 The campaign supports the purchase and renovation of the building and will also help grow the Junior Achievement Foundation of the Upper Midwest by providing funding to meet new demands for program expansion, operating needs, technology upgrades, and the ability to continue providing Junior Achievement programs to local schools at little or no cost. Demolition of the building began in March 2018 and involved “gutting” each of the four floors, leaving only the exterior structure, floor slabs and columns. There are currently 40 workers on-site that are busy putting up walls, painting, installing casework, ceiling and bathroom tiles. Work on a new glass canopy with painted steel support will wrap up at the end of August and a grand staircase will finish early September. Crews are also readying the 18 shops for JA BizTown and 18 shops for JA Finance Park that will serve as a blank slate for sponsors to create an inspiring learning experience for students. 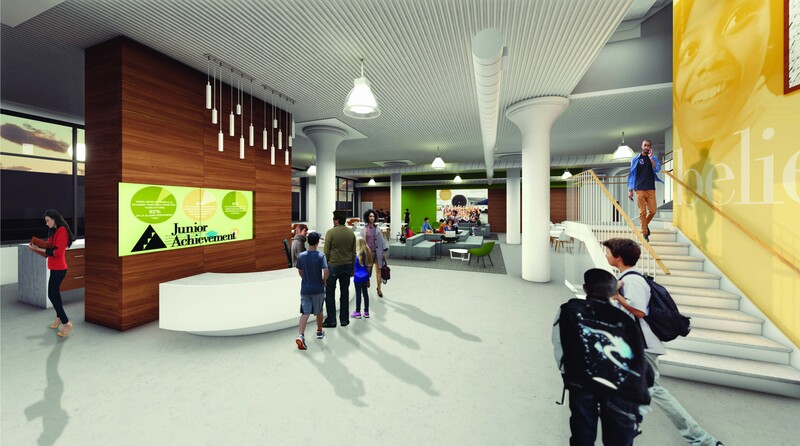 The new space will be ready for move-in early November with programming beginning January 2019. JAUM is making a significant commitment to sustainability. 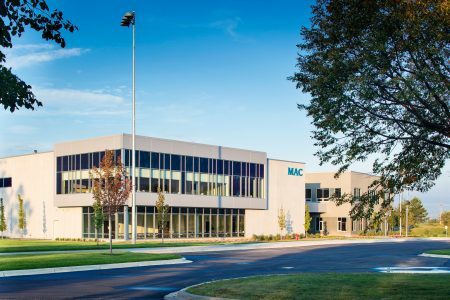 Through a partnership with the U.S. Green Build Council (USGBC) to integrate sustainability strategies into the building, including solar panels, energy efficient water heaters and HVAC system, and low flow toilets. JAUM will utilize USGBC’s ADVANCE program to track operational performance to achieve LEED certification. Students will support this effort by tracking key LEED certification requirements, including water usage, recycling practices, and energy audits. Teachers, volunteers, and corporate partners who visit the building will be encouraged to embrace sustainability practices, such as using public transportation, carpooling, and packing zero-waste lunches. Students participating in the JA BizTown and JA Finance Park simulations will learn about sustainability technologies, careers, and education requirements, and teachers will be provided with sustainability-focused curriculum that they can implement in their classroom. In addition, several shop sponsors in the experiential learning labs will implement at least one of the key LEED certification requirements. This sustainability strategy will be a true collaboration between JAUM and its volunteers, educators, and business partners.